When the Lord Mermington sighted the Danse Macabre, both crews knew the only resolution to the 8 week chase would be a bloody boarding action! A printable 30x30 rpg battlemap compatible with any RPG/Dungeon-Crawl or skirmish game. Use as a standalone gameboard, or combine with any same-scale tileset. Contents: A 30x30 map depicting a boarding action between two Sloop-style sailing ships, the Danse Macabre and the Lord Mermington. Both ships are armed with ballistae, but have closed for close combat. The Lord Mermington is beginning to burn, whilst the Danse Macabre takes on water. 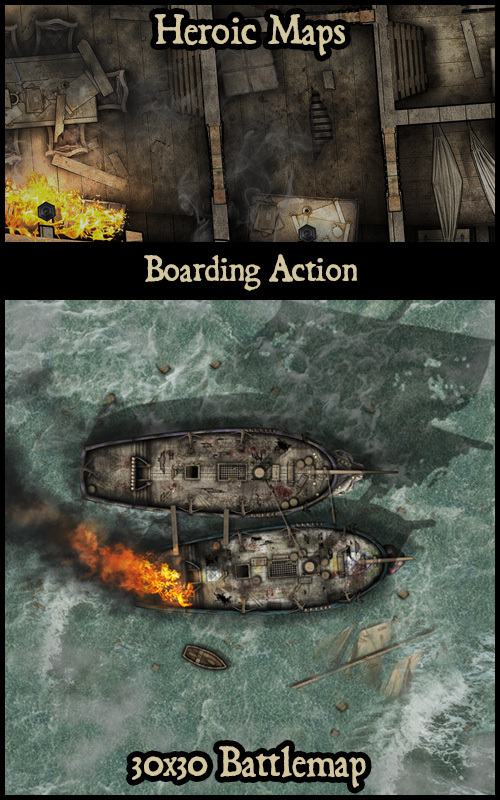 Both ships show signs of damage and combat. Both ships also include interior deck overlays, with damage effects. Want to sail these ships before they get into combat? Does this include a commercial license for RPG writers?